As of 2016, there are over 500 Amish-settled locations in the world. Most of those communities are quite small. For every large settlement like Lancaster County there are dozens of 1- and 2-church district communities. The Glens Falls Post-Star recently published a well-written and researched 3-part look at one of those small settlements, a relatively new Amish outpost in eastern New York. 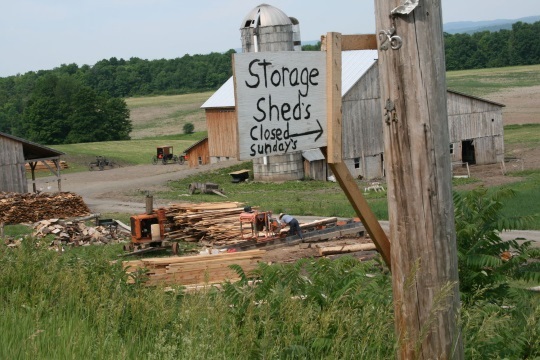 Amish moved into the Whitehall area–a stone’s throw from the Vermont border–in 2013, from the Fort Plain, NY settlement. According to the reporting, there are an estimated 200 Amish on 16 farms (a people estimate which feels a little high, but perhaps there is more than one household on some of these properties). You’ll notice in the photo that the buggy is the distinct brownish hue of Amish in the New Wilmington settlement (see our list of 5 6 Amish buggy colors). This is one of the more traditional and materially conservative Amish affiliations. The Amish at Whitehall have been well-received by their English neighbors, with little conflict (this is not always the case, but this series suggests Amish and non-Amish folks are getting along swimmingly). Part 1 describes how the Amish came to the area and the positive business impact they’ve had. Linda Lemnotis, owner of Green Mountain Food Services, said Amish families are regulars in her store. They buy a variety of items for the baked goods they make, as well as food for their families. She said she loves how “honest, courteous and polite” they are and added that she tries to help them out however she can. She knows they make banana bread a lot, so she offers bargains on bananas when they get a little ripe. Down the street at Dollar General, Kristy Clemons said Amish families are frequent customers there too. Are they making a difference in the store’s bottom line? “Oh definitely,” Clemons said. “They spend $100 to $150 every time they come in and we’ll have three or four families come in at a time,” she said. The families spend their money throughout the region. Ruth Scribner said she sometimes shops out of town for her Amish neighbors or gives them rides so they can shop for themselves. Part 2 explores general Amish beliefs and customs, explaining the importance of church and community, with a discussion of the Ordnung. This part includes comments from New York Amish author Karen Johnson-Weiner and Young Center researcher Edsel Burdge. If you buy items at a stand when both the husband and wife are present, he will likely be the one talking to you. But Amish women are not marginalized in their society, said Johnson-Weiner, who is working on a book about Amish women and who said she has several Amish women friends. “One Amish man told me, ‘I wear the pants in the family, but my wife tells me which ones to put on,’” she said, adding that she has retold that story to Amish residents and gotten lots of laughs. She said both husband and wife are scripturally obligated to serve each other, and though the men are seen as the speakers and decision-makers, the women are often behind the decisions being made. Minutes later, he was pulling into the Hatch Hill Road home of one family he buys pies from. A girl, probably 11 or 12 and clad in a traditional Amish dress and cap, approached his truck. He ordered the pie and told her he’d pick it up Friday. “Is your mom here?” he asked. “Oh, I was going to order a pie,” he said. “Well, you know, I can bake too!” she responded, hands on her hips. Caza said as the youngest of 13 children who grew up relatively poor and living off the land, he can relate to the Amish way of life. “They all treat me like family,” he said, adding that he has purchased numerous pies and baked goods, a quilt for his wife and a rocking chair from the Amish residents. This 3-part series on the Whitehall Amish is well worth reading for a look at how Amish and non-Amish interact in small local communities. Often the Amish are seen as desirable neighbors for both economic and other reasons (witness the recent efforts to recruit Amish to Prince Edward Island), though that is not always the perception. Whitehall seems to be a good example of a community which has, at least so far, enjoyed positive relations between Amish and non-Amish sides (though some of the reader comments below the article suggest that not all appreciate the Amish in the area). In addition, there is a heartwarming related story on Caza’s plan to give his 132-year-old broom-making machine to a local blind Amish teen. This was a very interesting article, Erik. Thanks for printing it. I am wondering if either Rebecca or Mark would do an article on what the role of the Amish grandmother is within the family. I would also like to know how the grandmothers spend their days, and what the life of older single women within the community is like. Rebecca is the writer. 🙂 I think she should consider it! I’m not a grandmother or a single woman, but maybe I could follow my mother-in-law around for a day or two and report what she does. 🙂 No… seriously, it would make a good post and I think Rebecca should tackle it. I thought it was nice too, Harriet. One of the better-done general newspaper articles on an Amish community. They didn’t have a ton of input from the Amish, but the other sources added quite a bit to the picture. Sounds like it has been a positive experience in the three years since they settled in the area. Thanks, Erik. 🙂 Rebecca is the real writer — I just add my two-cents. When the Amish came to town. 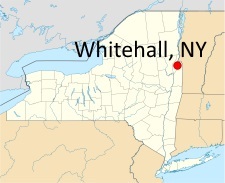 What caught my eye was my hometown of Whitehall, Wisc was named for Whitehall, NY! The first Amish came to the area in the early 60’s. One day two station wagons (no vans as of yet) full of Amish and a couple relators pulled into town. Off to the countryside they went looking for farms for sale. At noon they were in the City Cafe for lunch, and some locals who were also in the cafe were wondering who these strange looking people were! Gypsy’s? No. They’re Amish. Who are Amish? Then the tongues started wagging! The town has a population of 1500 and word travels fast! After a stop at the bank and feed mills, they left town. Soon after that visit word came that they had bought some properties and would be moving to the area. Now the whole community was going to be having an education about Amish people and how they live! It’s what the Amish did to their farms that had everyone in a state of wonderment. The power lines along with indoor plumbing went. Why in the world would you take a bathroom out and put an outhouse up? (My own mother asked that because she had grown up with an outhouse and thought indoor plumbing was wonderful!) People who had been in the homes visiting the previous owners were agast as to what was going on! Those back roads were busy with the gawkers driving by checking everything out! As I said, the town was getting an education..and they were! I should say towns, because other communities had to come and check out what was going on as well. How disgusted the Amish must have been! But all of this would have happened no matter where they moved. Ignorance is a terrible thing. Well, they stayed and are still there all these years later. When I’m in the area for a visit I make it a point to stop and visit with my Amish friends. And also with my ex-Amish friends, but that’s another story. Nice post Terry 🙂 Yes and at that time the Amish were far fewer in number (just 30-some thousand then vs. about 10 times more today) and certainly less well-known, so I am not surprised it caused a stir. What a great article series. My son lives just miles from Whitehall over the Vermont border. I’m in Illinois and we drive thru Whitehall to get to him. As a descendant of Jacob hostettler/ Barbara Stutzman I ve only recently discovered my Amish roots with many distant relatives in Holmes county. Fascinated with all these informative articles and can’t get enough. So drawn to a simpler but still busy life far from Chicago suburbs! I meant Christian Stutzman Barbara hochstettler. Mary if you are in the Chicago burbs, there are also some Stutzmans in the biggish Illinois community at Arthur, about 3 hours south of Chicago. Perhaps some of your roots could be found there as well. This in the settlement Ive been wanting to do a post about Erik!, so busy here on the farm I never seem to get time. Very friendly group, Its one big district about 180 on a Sunday, few that could not find farms have moved on to St Lawrence county, does not seem like they want to have 2 districts. Byler group, farming is stressed, all milking 15-20cows(hand) plus some side stuff saw mills, produce(very conserve, cut ice, shock corn and oats, no phone shanty, out house only, running cold water, tobacco use.. Many seem to be related, brothers, sisters etc. Mostly Bylers and Masts’. Seem to have followed a Mast Bishop but not a split. Very friendly and outgoing, I know one family well. This is a very hard working group. They have saved the farmland over there. Many are going organic because of higher milk prices. I live in Sandy Hook CT. My state hit by 4 tornados and a macroburst May 15, 2018. There are so many downed and snapped trees was wondering if anyone is interested in harvesting them. Plenty of good wood. Big Oak & Maple. Lots of pine too.